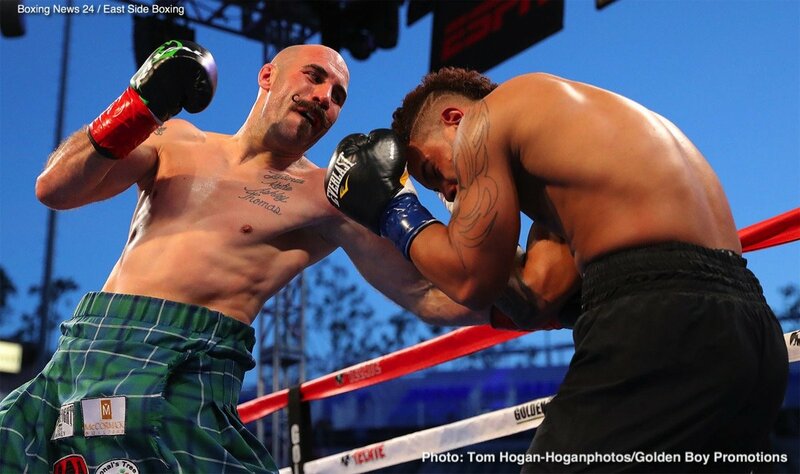 Both big (ish) names in the current middleweight division, former IBF champ David Lemieux and contender Gary “Spike” O’Sullivan are both hungry for big fights and the two are reportedly in talks for a September showdown. According to Lemieux’ manager Camille Estephan, who spoke to Canadian news’ TVA (tip from Irish-Boxing.com), the talks are taking place with a view to make Lemieux-O’Sullivan the chief support to the massive Gennady Golovkin-Canelo Alvarez return fight set for September 15 in Las Vegas. Lets go @spike_osullivan you wanted to fight me, I’m here. Don’t chicken out let’s give the fans a fight for September,” Lemieux wrote on twitter yesterday. When we look at the styles of the two men, Lemieux-O’Sullivan appears to be a guaranteed action fight; very possibly a real slugfest. After he was widely outpointed and outboxed by WBO middleweight champ Billy Joe Saunders back in December, it was assumed Lemiex, 39-4(33) would move up to 168 pounds and stay there. But after his catch-weight win over Karim Achour in May, Lemieux obviously had other ideas. O’Sullivan, a real crowd-pleaser of a fighter, is very much in line to fight the GGG-Canelo II winner, and if he did fight Lemieux it would in all likelihood be a final eliminator. This proposed match-up is a dangerous one for both fighters, but we fans would likely be winners if it did come off. Since losing via corner retirement to Chris Eubank Junior in December of 2015, O’Sullivan has reeled off six good wins and the 33 year old is used to fighting on big stages in America and in Canada. How much has 31 year old Lemieux got left and how badly did the near shut-out points loss to Saunders hurt his confidence? Can O’Sullivan take the former champion’s big bombs if they do get through? This match-up really does have the look of a 50/50 fight.